To make a booking online for the same day Arrival, is not going to be posssible. However, you can contact us via E-Mail or give us a Call and we will be happy to make the booking for you. Add to the peace and relaxation of your mountain visit with a trip to some of the beautiful North GA wineries and vineyards in our area. Georgia’s Wine Highway is rapidly becoming known for its fine family vineyards. Either you’re planning a romantic getaway, a friend’s reunion, celebrating your wedding anniversary or just for fun because you are a wine enthusiast, the North Georgia Mountains offer a wide range of vineyards, wineries and tasting rooms. Blue Ridge, Blairsville, Hiawassee, Helen, and Dahlonega are some of the cities where you’ll get an unforgettable wine experience! 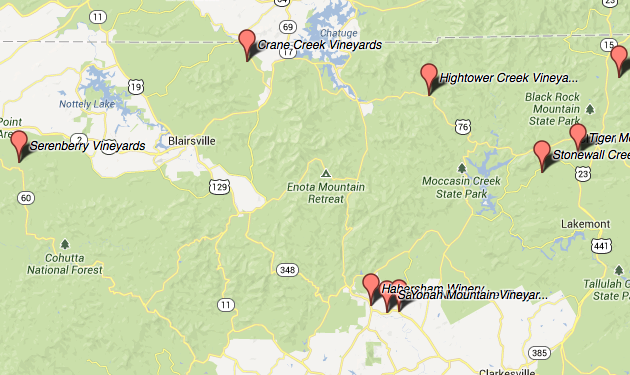 Many North Georgia wineries and vineyards offer wine tastings and winery tours. Some area vineyards also have restaurants. Wine Tasting’s and Tours offered Tuesday – Saturday all year round. Crane Creek Vineyards is in Young Harris GA, and just three miles of Brasstown Bald, the state’s highest peak. Their 20 acres of vines are planted in a variety of grapes: Cabernet Sauvignon, Cabernet Franc (European varieties), Chambourcin, Vidal Blanc, Seyval Blanc and Villard Noir (French American hybrid varieties) and two native American varieties: Catawba and Norton. The Crane Creek’s wines have been awarded in large national and international competitions. A sense of home. Wines created to reflect the people and place of Blue Ridge Mountains. Located in Hiawassee, GA, This little, family-operated winery & vineyard is committed to using only local fruit, producing consistently award-winning wines. The variety of grapes you can taste here includes Cabernet Franc, Traminette, and Norton. The Tasting Room hours are Friday and Saturdays, 12 p.m. to 6 p.m.
An ancient passion for wine. The vineyard and winery are family owned and even though they have been established in 2008, their 93 acre farm has been in the family since 1820. Their most representative grapes are plantings of Cabernet Franc, Cabernet Sauvignon, Chardonnay, Primitivo, Pinot Gris, Riesling, and the French Hybrids – Chambourcin, Chardonel, & Seyval Blanc. The soil makes the difference. Odom Springs Vineyards craft different styles of wines by planting the same grapes in different soil conditions. The grapes used for their wine labels are French-American hybrids. Currently, they have the following grapes growing; Chambourcin, Seyval Blanc, Vidal Blanc, and Norton. These grapes bring on incredibly flavorful wines. Their most representative grapes are plantings of Cabernet Franc, Cabernet Sauvignon, Chardonnay, Primitivo, Pinot Gris, Riesling, and some French Hybrids like Chambourcin, Chardonel, & Seyval Blanc. Hey, take note about this; tastings are $1 per wine. Nowadays they offer 9 of their own wines. Wine Tasting Room requires a reservation, at least 24-hour notice. Paradise Hills offer 5 different wine labels. 4 of them are exquisite blends. You can find interesting combinations like Vidal Blanc and Chambourcin grapes, Cabernet Sauvignon and Norton, Seyval Blanc, Cayuga, and Vidal Blanc grapes. All of them pair perfectly with southern food and ethnic cuisine! A local vision of wine production. The Serenberry wines are made from grapes that were born and raised in Georgia. That’s a way to support local farmers. Their wine tastings are four for $4 or seven for $7 and currently have seven to eight wines in the bottle. The white wines rank from fruity, sweet and dry. Sounds gorgeous right? A perfect venue for weddings, parties & corporate meetings. Habersham Vineyards & Winery is one of Georgia’s largest and oldest wineries. Sharp Mountain Vineyards, operates on the simple but essential principle that to produce the finest wine, you must begin with the finest fruit. This quest for perfection requires personal attention to every detail-from employing tried and true “wine growing” practices to personally harvesting the best grapes and handcrafting the wines. 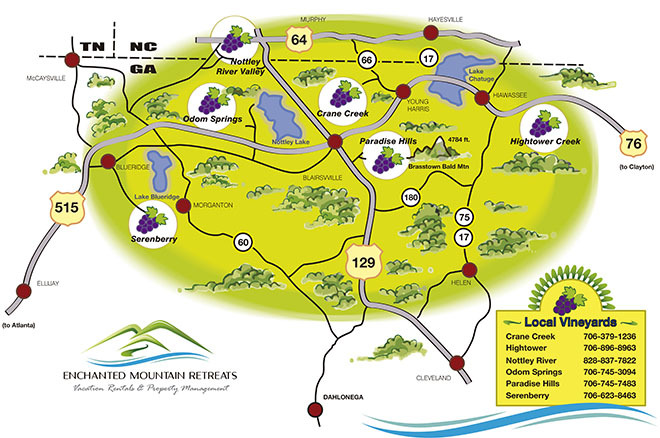 Learn more about vineyards and wineries in the North Georgia Mountains and and general resources to immerse yourself in this exciting world. The wine wolrd is awesome. Get quick tips, interesting facts and other graphic resources, visiting our THE ENCHANTED MOUNTAIN RETREATS FAVORITE WINERIES & VINEYARDS ROUTE BOARD on Pinterest. Share the info with family and friends! See the following videos for a quick hint of the local wine production and tasting tips. To help you unwind from your busy life reconnecting with nature and with your loved ones in luxury pet-friendly accommodations where you will make long-lasting memories.